← Love your coffe? Reduce your environmental impact. It's been 3 weeks since the flood that hit Brisbane shutdown the city and affected thousands of people in Australia's third largest city. While our office in West End wasn't flooded, being on the fourth floor, the buildings underground carpark was. This resulted in our office being closed for a couple of weeks as everything from communications systems, to fire-control and the lift were affected. I went for a walk along the Brisbane river near our office this week to see what the area that was inundated looked like now. The first thing that hit me was just how quiet the river is. The water traffic that you associate with our city is gone. No ferries, commercial or pleasure boats. In many cases, the pontoons that they would use are gone as well. As I walked along the path beside the river, the signs of the flood were still in evidence in the trees around me. Rubbish is stuck in the branches a metre or more above my head. That said, the road, the gardens and buildings are mostly clear of the sludge and rubbish the flood waters dumped, testament to the hard work of the local people and businesses. As I got towards an open section of the river, I came across the first boat I'd seen. 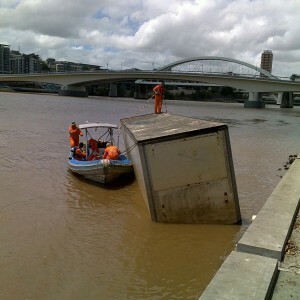 A recovery team was next to what, at first appearances was a shipping container caught on the embankment. It wasn't until I was closer that it became clear this was an entire trailer from a semi-trailer. Who knows where it came from, but it highlighted the force of the river at it's peak that it could wash this away and down the river. Despite the great work of everyone involved in cleaning up, there is still alot to do to return our city to normal. This entry was posted in West End Wanderings. Bookmark the permalink. Amazing what the power of nature can do! Glad that things are getting better!